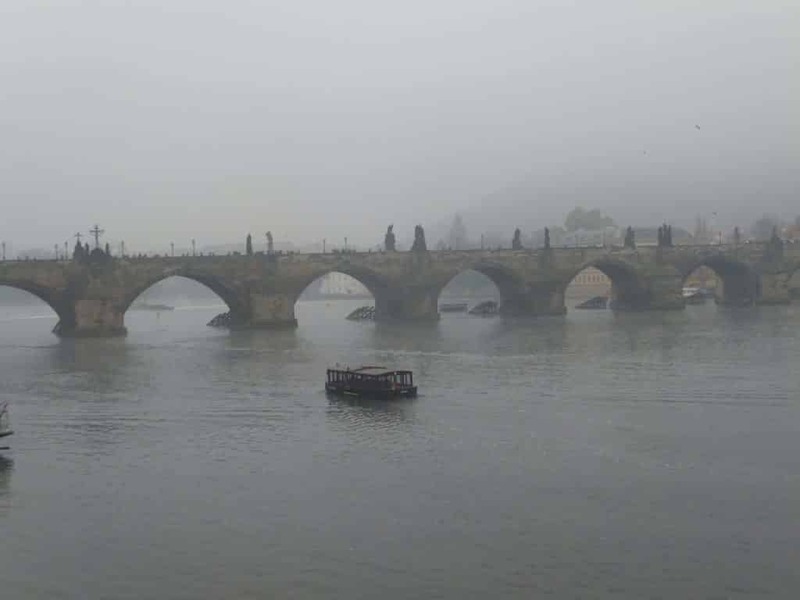 It was my last day in Prague and I was freezing. Despite my sweater, wool coat, mitts, and scarf, the chill in the air drove right through my bones. 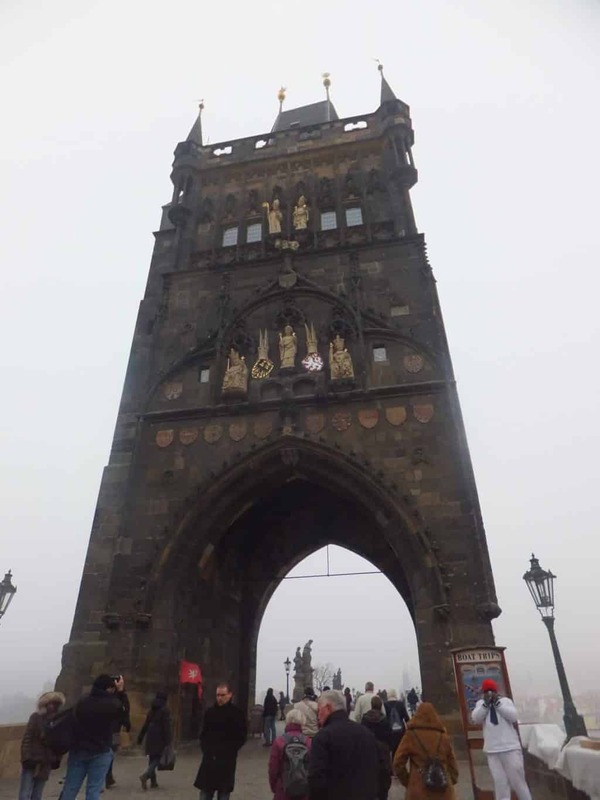 For most of the day I stood, with a group of strangers, huddled against buildings in an effort to avoid the wind as we learned about the history and mysteries of this beautiful city. It was fascinating, but the freezing temperatures took away some of the magic, and like the poor Aussie guy beside me in just a sweatshirt, I kept checking my watch hoping our tour would soon be over so I could escape to somewhere warm. My wish soon came true and waving goodbye to the group, I headed along the river with my camera. 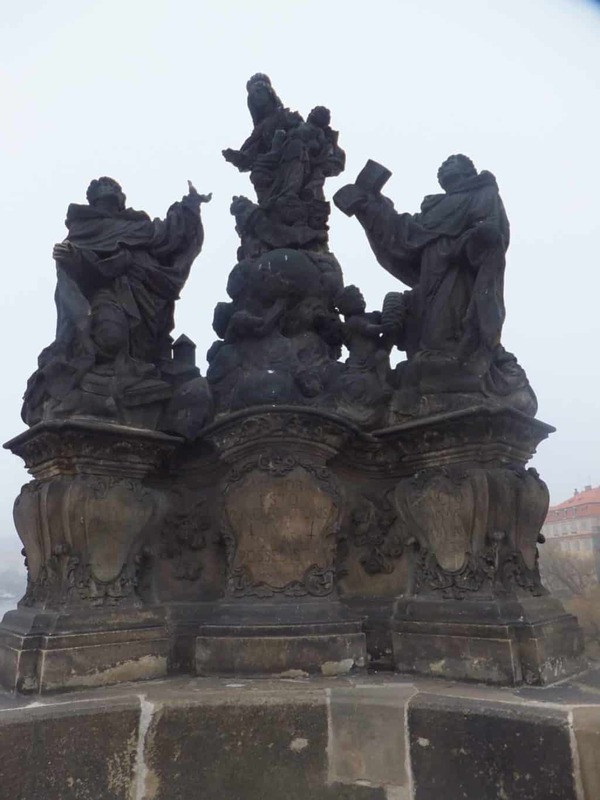 I had a little less than two hours before I needed to be at the bus station for my ride to Munich; plenty of time to take a last look at the famous Charles Bridge before heading back to collect my bag at the hostel. The cold winter wind whipped my scarf around my face, burning my cheeks and turning them bright red. “Soon” I promised myself, I’d head indoors. Just a couple quick pictures without yesterday’s crowds and I’d be good to go. I pushed myself to walk faster, and soon crossed under the first bridge tower. There were policemen nearby, sheltered under the tower from the wind; likely watching for any pick pockets known to frequent the area. Ignoring them I moved along, looking at the statues that lined the bridge. It was there that I notice something odd; a bundle of dark blankets pressed as close to the wall as possible. With a closer look I saw it was a man and his dog, wrapped up in a mishmash of blankets and clothing. He could have been 20 or 100 for all I could see. His face was covered and hidden and all that was visible was his hands; dried and cracked as he hugged the dog close to his chest. He wasn’t a beggar; there was no hat or bucket for change, no sign, and he didn’t even lift his head as tourists and locals walked by. Huddled between the wall and statue sign I could only assume he was trying to avoid the cold, and possibly the cops. Passing by with the crowd I took my photos then headed back to the metro. As I passed by for the second time my eyes went back to him; watching as he tried to re-arrange the blankets to better cover his dog. “He’s just another homeless man” I told myself, “you can’t help them all”. Still, as I walked off the bridge, I felt guilty. Thoughts of this poor man and his dog circled my head as I headed to the nearest metro, and as I crossed the street I noticed a small café. Detouring I headed for it, and its promised warmth. “How much for a hot chocolate” I asked the barista. He named his price and I pulled out my wallet and counted. I had just enough to cover the cost, but it wouldn’t leave me any change for a metro ticket back to the hostel. And, with my bank card having been compromised the day before, I didn’t have access to any more money. I thought about it for a minute, and then handed my change over in exchange for a piping hot cup of hot chocolate. Thanking him, I left the warmth of the café and headed back to the bridge, to the man with the dog. He was right where I left him; a nobody, ignored by the endless crowds passing by. Dodging past a young family I headed for him, crouching down to pass him the cup. “Here you are” I offered, holding the cup out to him. He hesitated for a minute, then, without ever looking up, took it. “Dĕkuji” he mumbled back at me, and then tucked it close to his chest. Smiling to myself I walked away, and back to the metro where I snuck on and prayed that no one made a check. It was a nerve wracking ride, having seen a local getting yelled at and pulled off two days before for being ticketless. Thankfully it was my lucky day and I got off at my stop with no-one the wiser, leaving me content with the fact that even if I did break the law, at least it was for a good reason. Oh Hannah, such a heartwarming story. I always feel bad for the homeless people too, and always wonder how they must survive during the cold months. It’s so heartbreaking that he had his dog and was trying to keep the dog warm :'(. I always wish there’s something I could do too, but of course there’s not. It’s so so nice of you to have done what you did. It’s tough to see for sure. I know a lot of homeless people have dogs and use them to tug at heartstrings with their ‘need dog food’ signs, but this one was so authentic I had to do something or I know I would have regretted it. What a fantastic story! I am sure that you totally made his day 🙂 Or at least helped to warm him up a bit with something soothing & yummy. I’m glad you didn’t get caught without having a ticket, too – it wouldn’t seem fair at all! Wow that fog is intense! 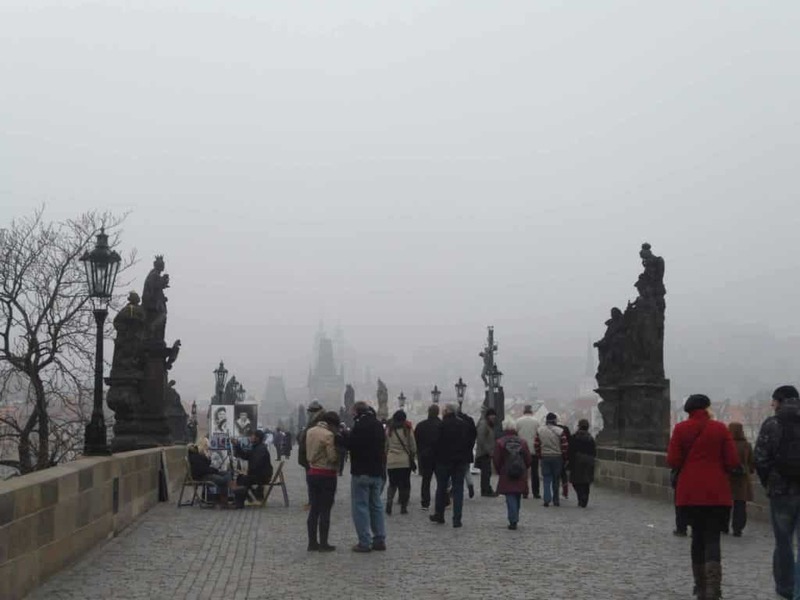 Haven’t been to Prague in the winter before – crazy!! What a fantastic read. It’s all too often that we overlook these small moments on our travels that can change our day or our life, but it’s these that make lasting memories. Aww, this is so sweet and heart-warming! It’s true, you can’t help them all, but at least you added a bit of happiness and warmth into the world. You definitely did the right thing – so good to read a tale like this. Unfortunately we have a real homeless problem here in Prague. My partner used to buy the same guy a hot coffee and croissant every morning he saw him on his way to work. We eventually ended up giving him our old duvet covers and some jumpers. Also whenever we have a big party we always gather up the leftover food at the end of the night and walk around the city to find homeless men & women to give it to. They don’t get a lot of help here so its the least we could do…especially in the winter when it drops below minus 10! Sadly I think homelessness is a problem everywhere, and while I know plenty of stories can be traced to substance abuse there are plenty of individuals who just have it really hard. Either way these people deserve a bit of kindness and it’s nice to be able to help them when possible. That was beautiful, I’m in prague now and I’ve never seen so many human/ dog companions… it’s both beautiful and heartbreaking. I’ve tried helping out the little I can, I’ve also come to realize that a lot of these dogs are usually lying down or sleeping when I see them. I found a puppy also sleeping which is odd that they’re all like that…. Glad you enjoyed! Yeah, it’s sweet/sad at the same time 🙁 I’m sure the dogs are incredibly underfed and watered which is part of the lethargy, especially since its now summer.